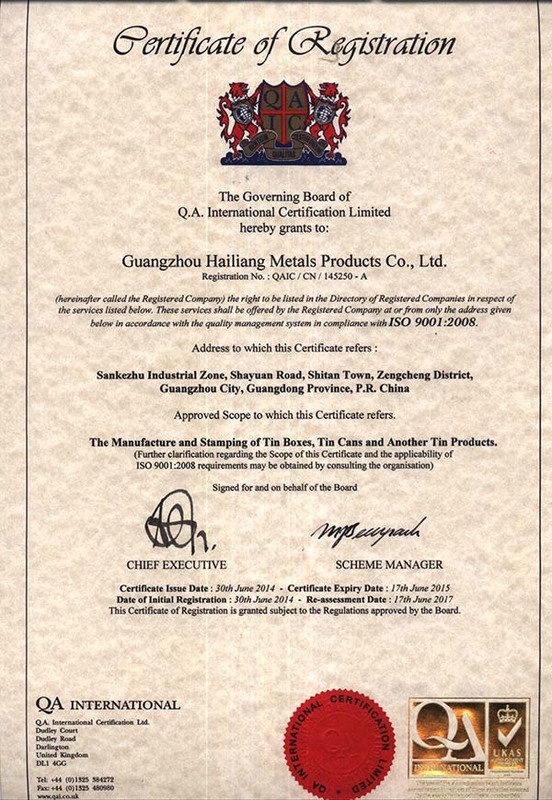 Company Overview - Guangzhou Hailiang Metals Products Co., Ltd.
5YRSGuangzhou Hailiang Metals Products Co., Ltd. Established in 2007, Hailiang is one of the leading tin box manufacturers in southern China, with a history going back over 10 years, we now have over 1,000 molding tools available in the warehouse. No matter what iron or tin box you need, be it a gift box, chocolate box, candy box, cigarette box, lunch box or any custom item, Hailiang can deliver exactly what you want when you want.Here at Hailiang, we cover all aspects of the process in a one-stop shop, including: design, printing, manufacturing, packing, delivery and metal proofing (if needed).With our key focus products on innovation, reliability, quality, efficiency and service, we have reached out to more than 30 countries.If you emphasize quality like us, please do not hesitate to contact us. Let's bring the business to the next level. The Manufacture and Stamping of Tin Boxex, Tin Cans and Another Tin Products.